The tide may be turning somewhat for coal and natural gas generation with coal regaining some of the market that it lost in 2012 due to low natural gas prices. Natural gas prices delivered to the electric power sector averaged $3.52 per thousand cubic feet in 2012, 62 percent less than in 2008 when it reached $9.26 per thousand cubic feet. For the first 2 months of 2013, they are higher on average by a slightly more than $1.00 per thousand cubic feet. This allowed coal to increase its share of electric generation to 40 percent for the first 2 months of 2013, compared to 37 percent during the first 2 months of last year, while the natural gas share of the generation market fell from 28 percent to 26 percent during the same time period. This change, however, will not be a coal renaissance in the electric power sector since new and pending regulations by the Environmental Protection Agency (EPA) will ensure no new coal-fired plants are built and older coal-fired plants will find it uneconomic to continue operating because of increasingly-stringent EPA regulations. Some analysts are forecasting that coal may supply 40 percent of the power market for this entire year, up from 37 percent last year, while natural gas will supply 25 percent, down from 30 percent last year. 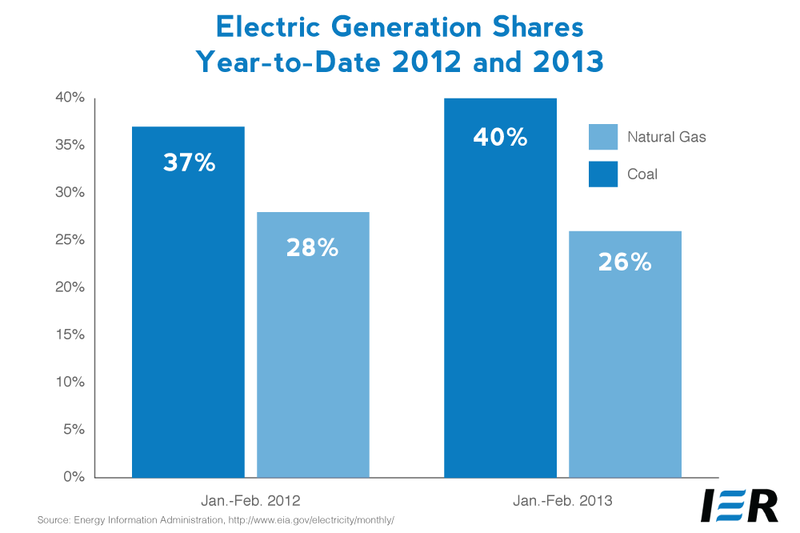 [i] The Energy Information Administration in its Short Term Energy Outlook is agreeing with the coal share of 40 percent for 2013, but its forecast for natural gas generation is higher at 28 percent, although still lower than the 30 percent natural gas share achieved last year in the generation market. EIA does not see a renaissance to coal’s almost 50 percent share attained not long ago, forecasting a continuation of the 40 percent share of the generation market for 2014. [ii] That’s most likely due to EPA regulations, which reflect President Obama’s promise in 2008 to reduce carbon dioxide emissions and his later pledge to “look for other means” to control such emissions. The Obama Administration’s EPA has promulgated new regulations that will result in the demise of the domestic coal generating industry. The new rules target mercury from coal-fired power plants (the Mercury and Air Toxic Standards), which many call Utility MACT because the rule requires “Maximum Achievable Control Technology” for mercury at coal-fired power plants. 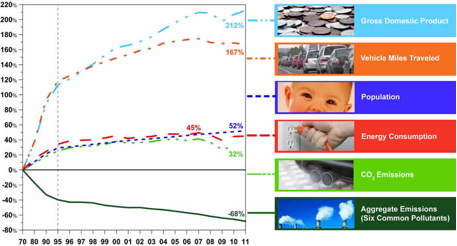 These technologies must be installed over a tight 3-year period between 2012 and 2015, raising the cost of generating power from existing coal-fired plants where the economics make sense to install the technology, or force plants to retire or to convert to natural gas where the economics of adding the additional environmental technology are not favorable. EIA announced that plant owners and operators expect to retire about 27 gigawatts of coal-fired capacity by 2016 — four times the 6.5 gigawatts of capacity retired between 2007 and 2011 mostly because of the new regulations imposed by the EPA. 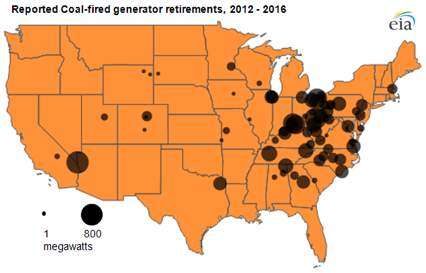 In 2012, electric generators are expected to retire 9 gigawatts of coal-fired capacity, the largest amount of retirements in a single year in America’s history. The 27 gigawatts of retiring capacity is 8.5 percent of total coal-fired capacity (318 gigawatts). 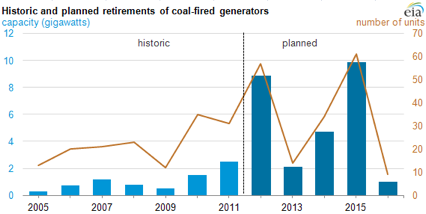 The 2012 record retirements are expected to be exceeded in 2015 when nearly 10 gigawatts of coal-fired capacity are expected to retire. [iv] Most of the units retiring are located in the Mid-Atlantic, Ohio River Valley, and Southeastern United States as shown in the map below. Further, pending greenhouse gas regulations will require all new coal-fired plants to reduce their greenhouse gas emissions even though there is no cost effective way to do so. This is essentially a ban on new coal-fired plants because the technology does not exist commercially for them to meet natural gas carbon dioxide levels that are required by the EPA regulation. Two factors have and are affecting coal-fired generation: natural gas prices and new and pending regulations from the EPA. Recent data have shown the effect that these factors have on the generation market. The higher prices of natural gas at around $4.50 per thousand cubic feet delivered to electric utilities this year is making coal more cost competitive compared to natural gas, but new and pending EPA regulations are likely placing a ceiling on the amount of generation one can expect to get from coal– at around a 40 percent share.